RESIDENTS OF Kararia, Barkhera, Pathani and Shahpur villages in Madhya Pradesh’s capital district Bhopal will soon lose the vegetables they have been growing. The loss will not be due to some disease or untimely rain. The plants will be destroyed by the government because sewage water was used to grow them. On January 19, the Madhya Pradesh Pollution Control Board (MPPCB) verbally asked Bhopal’s additional collector Akshay Singh to get the crops removed in these four villages, declaring the drain water unfit for irrigation. Singh’s office says sewage was being used in 70 hectares (ha) in Bhopal, of which farming on over 45 ha has been stopped till January 2015. Experts say the decision was wrong as a ban on sewage water for irrigation in a water-starved country like India would do more harm than good. What is needed is a periodic monitoring to ensure that the sewage used does not have toxic elements or heavy metals in high concentrations. The decision has farmers up in arms. Rahul Dhoot, district vice-president of Bharatiya Kisan Sangh, said Singh’s office does not have any report to prove that sewage water is unfit for irrigation. Banning the use of sewage water for farming in Madhya Pradesh started in May last year when, in response to a public interest petition filed by Subhash Chandra Pandey of Bhopal, the National Green Tribunal (NGT) ordered that such plants should be destroyed. Pandey had identified six location where sewage farming was being done and said that eating such vegetables could be harmful. NGT passed an order to the agriculture department of the state asking it to work with district collectors and stop farmers from selling these vegetables. It also asked the state’s horticulture department to submit a report on whether vegetables grown with sewage water were harmful. The report is not yet ready and NGT has fixed February 20 as the date of next hearing. NGT had also asked MPPCB to submit a report on its view on sewage farming in the state. Gurwant Joshi, chief chemist in the monitoring section of MPPCB, who has been involved in the preparation of the report, said that in September 2014 the board was asked by the state government to survey six representative sites across Madhya Pradesh to study the issue. The ban, however, has left farmers puzzled. Dhoot, whose association is fighting for farmers’ rights in the state since the 1980s, says sewage farming has been going on for over 40 years and no health issues have been reported. Raju Patel, a farmer from Bardhai village, agrees. Patel says he has been irrigating his crops with sewage water for more than 20 years and before him his father did the same. He cultivates cauliflower, methi (fenugreek), tomato and spinach and sends 700 kilogram of vegetables every day to market. Dhoot says farmers are unhappy with the decision because irrigating with groundwater would increase expenditure. According to a research by People in Centre Consulting, an Ahmedabad-based consultancy, about 73,000 ha of peri-urban agriculture in India is dependent on wastewater for irrigation. 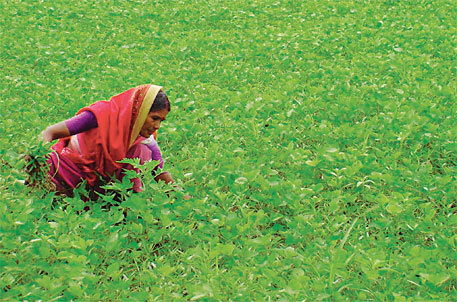 In these areas farmers usually adopt round-the-year intensive vegetable production system. The yield under this system is 300-400 per cent more than usual. Compared to freshwater, sewage water irrigation increases the earnings by up to four times. Banning wastewater irrigation would be neither practical nor feasible and economic impact of the decision for urban and peri-urban farmers would be huge, says C S Hunshal, dean of College of Rural Home Sciences, University of Agricultural Sciences, Dharwad. Hunshal says a comparison of vegetable yields from wastewater and borewell irrigated fields showed a 20-25 per cent advantage from wastewater irrigation. Shafiq-Ur-Rehman, head of environmental sciences, Sher-e-Kashmir University of Agricultural Sciences and Technology, says sewage water can be used effectively in areas facing water stress. His study in a Srinagar locality found that municipal wastewater effluents contained traces of elements such as iron, copper, manganese and zinc in small and varying concentrations. But they were not beyond the prescribed limits and did not pose a health risk. However, he cautions that careless use can cause health problems to farmers and there have been instances where farmers using untreated sewage showed high prevalence of diarrhoeal and skin diseases, and helminthic infections. Nigappa M Rolli, a researcher at BLDE Association’s degree college at Jamakhandi, Karnataka, agrees. He says it is always better to treat sewage before irrigation and this can be done through aquatic macro and microphytes (plants that help in cleaning wastewater by absorbing nutrients). Nigappa says elements such as zinc, manganese, nickel, cadmium and copper present in sewage provide nutrients to plants, but when found in heavy concentrations (or due to irrigation with sewage water for a long duration), they may enter the food chain and cause kidney and gastrointestinal problems. Even the problem of toxic heavy metals, which are sometimes present in domestic sewage and can accumulate in soil or seep into vegetables, can be resolved through monitoring, he says. There are a lot of countries which use sewage for farming. According to the Institute for Global Environmental Strategies, a Japan-based research organisation, 20 million hectares of land in 50 countries was being irrigated with raw or partially treated wastewater in 2000. This is almost 10 per cent of the total irrigated land in the world. Countries such as Vietnam, Kuwait, Israel, Tunisia, Jordan, Morocco and China extensively use wastewater for irrigation. Vietnam produces 80 per cent of its vegetables using wastewater. Wastewater is also used by farmers in water scarce regions of developed countries in North America and Europe. 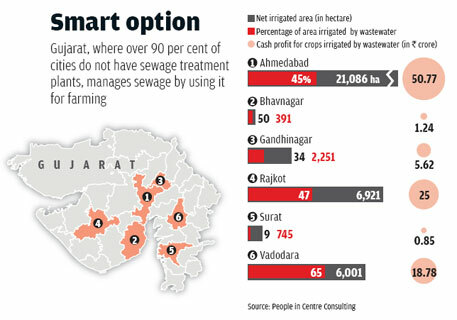 In India, Gujarat is one state which has shown how sewage management can benefit agriculture (see ‘Smart option’).The water-scarce state, in which over 90 per cent urban bodies do not have sewage treatment plants, realised that using sewage for irrigation solved many problems. It reduced the use of groundwater in agriculture, ensured management of sewage, improved yield and earned government money. The state has different mechanisms in different cities for wastewater management. Cooperatives have been formed in Rajkot, Bhavnagarand Ahmedabad to monitor wastewater used by farmers. These cooperatives have been functional for the past 40 years. The tariff is collected by municipalities. In Gandhinagar, wastewater is carried in a 22-km-long underground pipeline from which farmers extract water and the irrigation department of the state tracks the use and charges farmers for it. However, with the exception of Gandhinagar, the sewage supplied to farmers is not treated in most of the cities. Sewage can be used for farming provided it is retrofitted with Eco technology that addresses chemical toxicity and bio-hazard. Many trials were done over the past years to establish the safety and efficacy. However, the present pollution board standards are those decided by industry which manufactures waste water treatment equipment and also norms from the W.H.O. arrived at by Western understanding of Nature. Stake holders needs to understand how to evaluate water quality, and this is possible even without a laboratory. This ban is illogical. Even when sewerage water is used the plants takes only the chemicals in it as fertilizers and hence there is no health issue involved. If seweage water cannot be used then it cannot be released to river or sea even after treating the same for safety. Plants have better mechanism than human's instruments to absorb only the safe elements from sewerage water.